Professor Teaches Windows 8 helps you learn Windows 8, the completely redesigned version of Microsoft's popular operating system. Professor Teaches Windows 8 offers hours of interactive tutorials and lessons to learn Windows 8, for beginning to advanced users. With this computer training software, you'll be able to learn the Microsoft Windows 8 operating system at your own pace by practicing in a realistic simulation of the software. 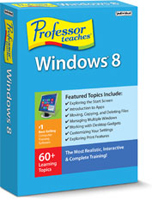 Professor Teaches Windows 8 helps you learn all of the new features of this completely redesigned operating system. 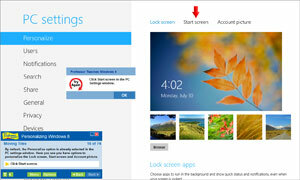 Learn how to personalize Windows 8. Practical exercises and examples make learning easy and step-by-step interactions help you retain the information you've learned. What is Microsoft Windows 8? Windows 8 is the latest version of Microsoft's popular computer operating system. It has been completely redesigned to make everyday computer tasks simple and easy, and allow users to connect with their information and people from multiple Windows 8 devices. 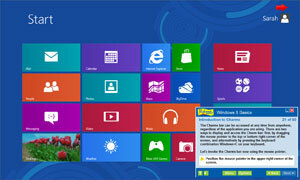 What are the Benefits of Learning Microsoft Windows 8? Learn to use the new operating system quickly and effectively with hands-on, interactive training, not with how-to books or manuals. Find out how to take advantage of the new features with Professor Teaches Windows 8, including How to Use the new Start Screen, which replaces the Start Menu, Introduction to Charms, Using Tiles, How to Search, and more.